For some time, we had been flirting with the idea of doing something productive with our unwanted 12,000 gallon in-ground swimming pool. 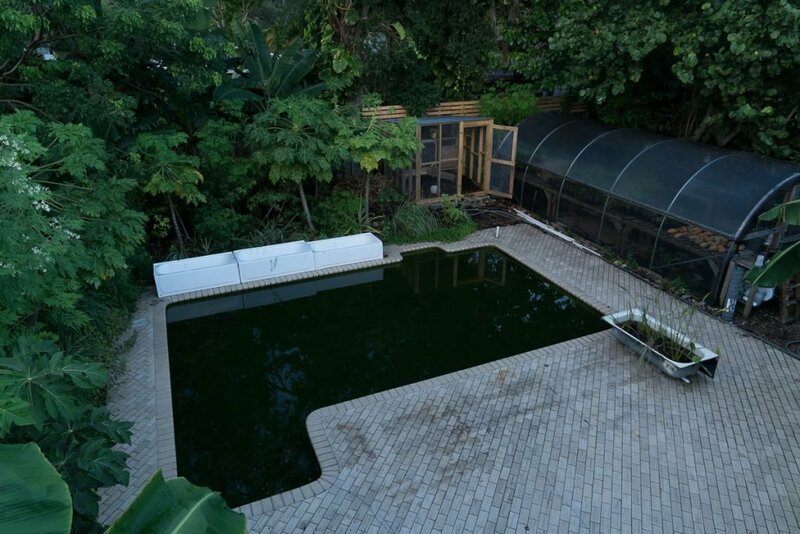 It was during my Permaculture design course with Geoff Lawton last year that I decided to commit to a full conversion to an aquaculture wetland. What seemed like my most daunting project to date has turned out to be one of the best decisions I’ve made. The design is basically a simple reticulated system. Water is collected from the surface of the pool by the skimmer and from the bottom by the pump. The water is then pumped up to a radial flow filter. The Flow filter forces the water to drop what its carrying, preventing the gravel reed bed from getting clogged with sediment. From here, gravity takes over. Water meanders through three tiered 30”x60” (76 cm x 152 cm) bath tubs, falling from one to the other via a spreader pipe. The water then falls back to the pool through a pipe hidden in a piece of bamboo. Bamboo pipe and waterfall aeration. There is a small air pump hidden under the deck and two air stones inside the pool. Water falling from the reed beds, along with the aerator, supply all the oxygenation the system needs. I thought the corner deck would be a nice place to hang out and relax. It also serves as a place to hide some of the plumbing. The deck shades a portion of the pond as well helping to cool the water. Plus any fisherman can tell you fish love to hangout under docks. First step was to do as much research as possible given the fairly uncommon nature of this kind of retrofit. YouTube was indispensable for this task, and Geoff lent some guidance. From here, I could start sketching out some rough ideas and sourcing parts and materials. Next step was to put together a plant list. 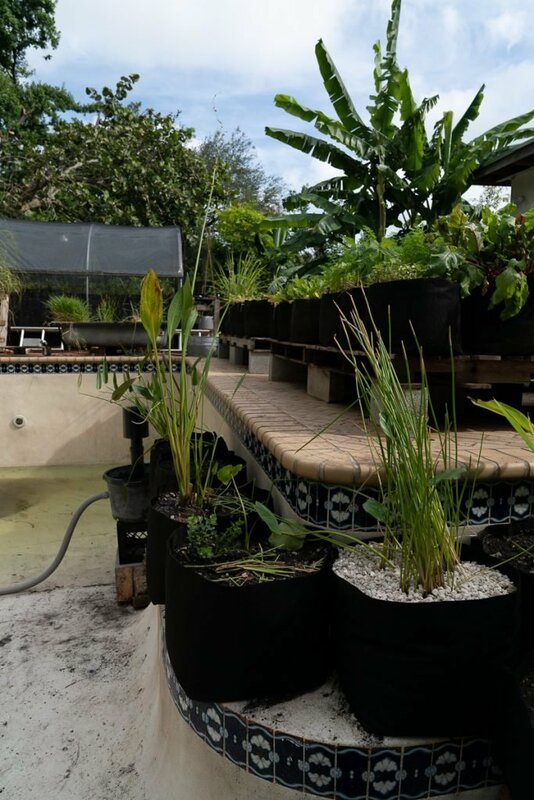 Collecting plant material early on allowed me to propagate clones of my aquatic plants while I was going through the design and construction phase. 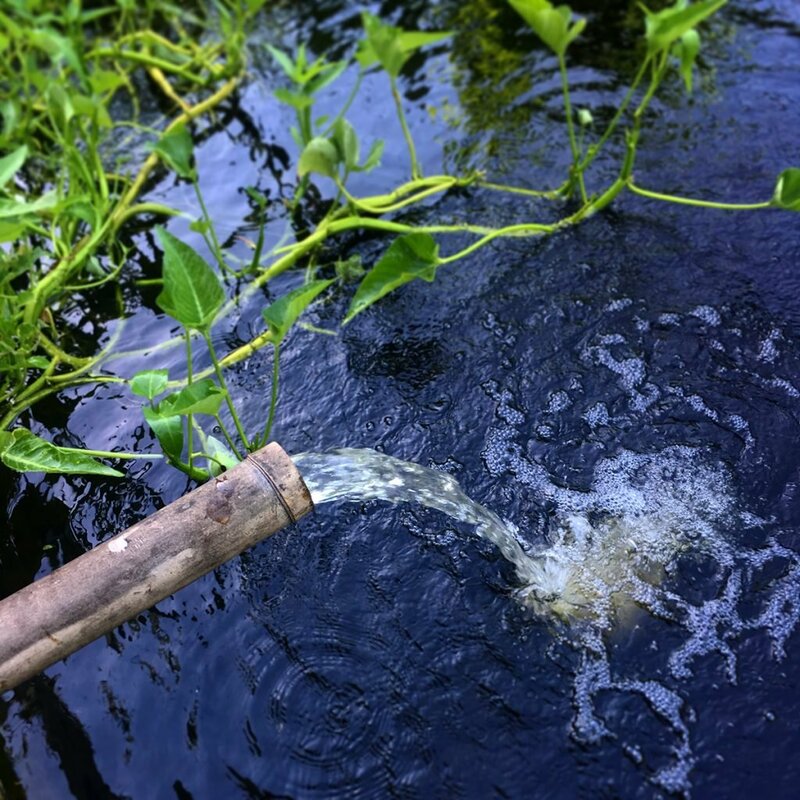 Most aquatic plants have dense tuber like rhizomes that make it simple to divide plants for propagation. An old bath tub from Craigslist made a handy nursery, and with the rampant growth of aquatics I quickly had a good supply of plant starts to kick off the system. I did my best at this point to finalize the design on paper. That being said, there were a lot of variables that would have to be figured out in situ. Sourcing pumps and calculating pump size would come next. I decided to go with a 4,000 gallon per hour German made pump from Oase. When choosing a pump you really don’t want to be undersized especially when lifting water. Solar pumps were considered but I decided this would over complicate my first venture into aquaculture. Regardless, savings in electrical costs would be significant over the old pool pump. In the event of prolonged power failure, I will be forced to either destock or run a generator. Once I had everything I needed on site: pump, bathtubs, gravel, flow filter parts, etc. the pool was drained and the inside was pressure washed. A note on draining: If you are planning this type of conversion and have a regular chlorinated pool you do not need to drain the pool. Simply stop adding chemicals and continue to run the pump for a week or two. The agitation from the pump will evaporate off the chlorine. Once the pool is green you’re safe to proceed. If you have a salt water system, as I did, you will need to drain the pool and thoroughly clean any salt residue off the inside. This gave me a chance to inspect the inside of the pool so I didn’t mind. Reed beds leveled and linked together. Next, I positioned the reed bed tubs, leveled them, and linked them together with the spreader pipes. After positioning the tank for the radial flow filter, I started constructing the wood enclosure. It’s a good idea to thoroughly test your reed bed system before completely closing it in. 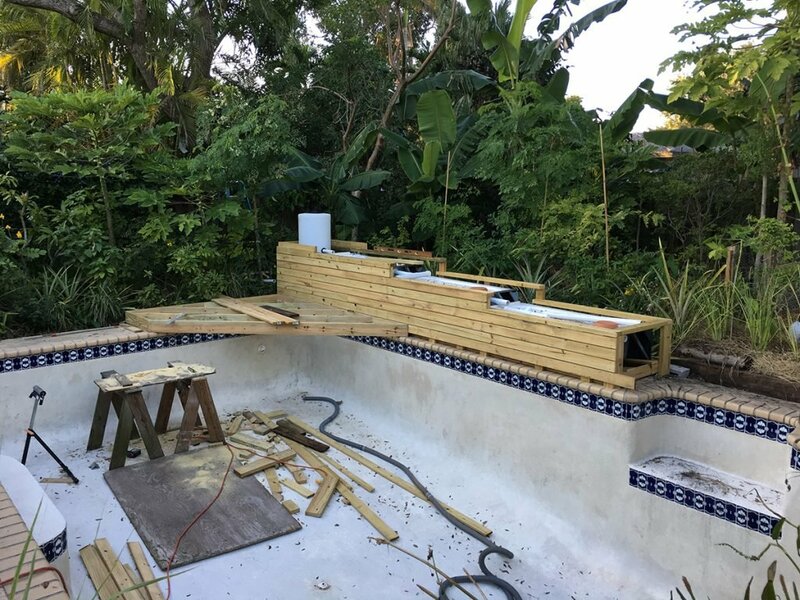 Wood enclosure and corner deck in progress. 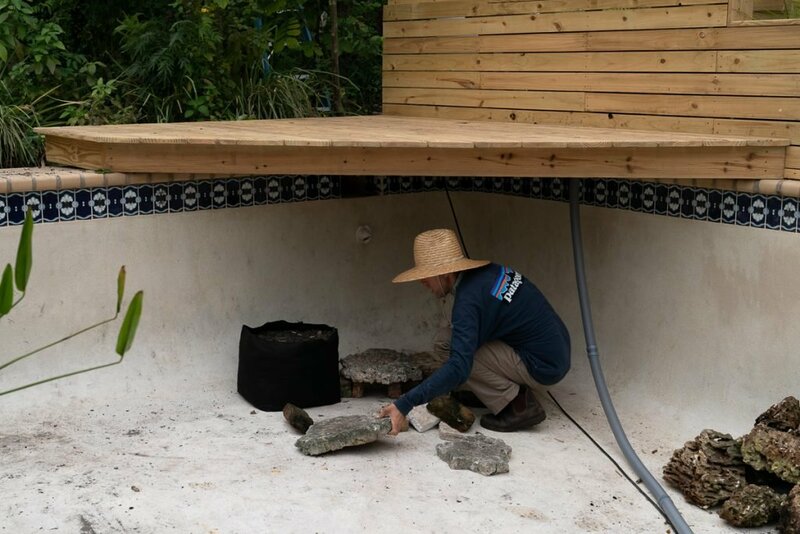 The only thing left was to construct some rock piles in the bottom of the pool for habitat and position the grow bags with plants on the steps and ledges. I filled the pool a few weeks later. Once the system was stable, I added the Gambusia and grass shrimp. Tilapia and crayfish would come later. 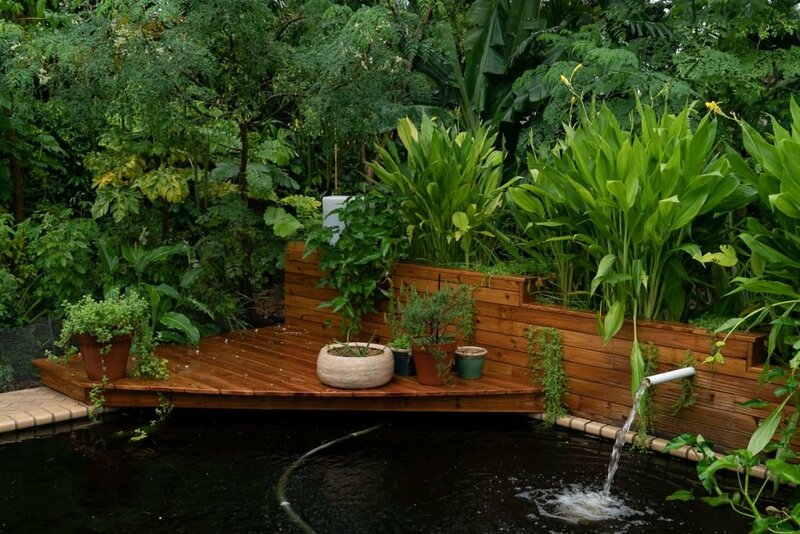 Lastly I added a bamboo raft of Vetiver grass and another raft with native ferns and kang kong ( ipomea aquatica). Habitat Features Going in Skimmer and grow bags setup on swimmers ledge below kitchen garden. 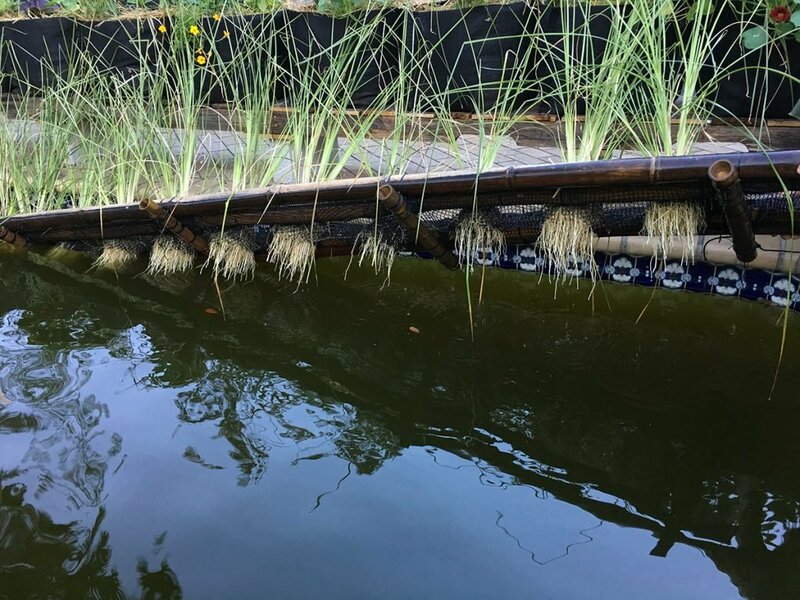 Bamboo raft planted with Vetiver grass. Keep in mind, when you first fill the pool you are going to get an initial algae bloom that will make the water resemble pea soap. Don’t freak out this is natural. After the plant roots start to spread and the gravel builds a thin layer of bioslime, the water should start to clear. Bioslime is the algae and microorganisms that actually clean the water. This should take a few weeks depending on your climate. Tadpoles are very effective at controlling surplus algae as are carp. Frogs and tadpoles are also a good bioindicator due to there sensitivity to toxins so I try to encourage them. 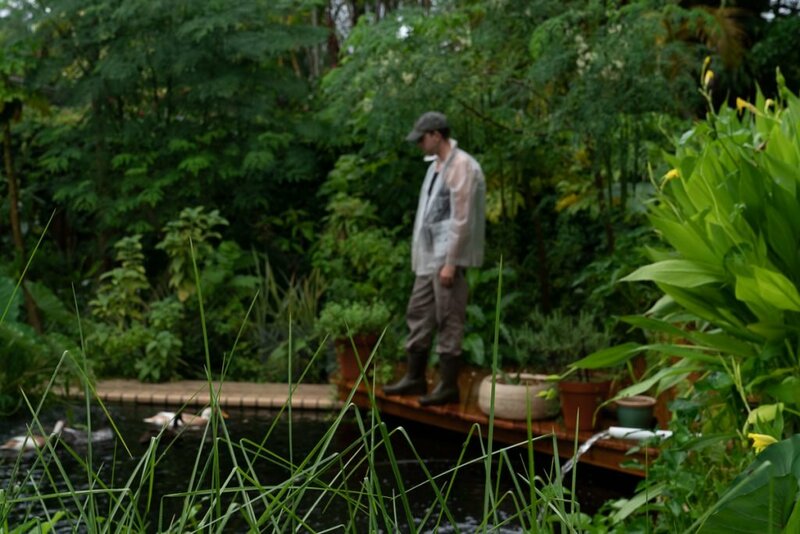 Floating island with Vetiver raft in background. 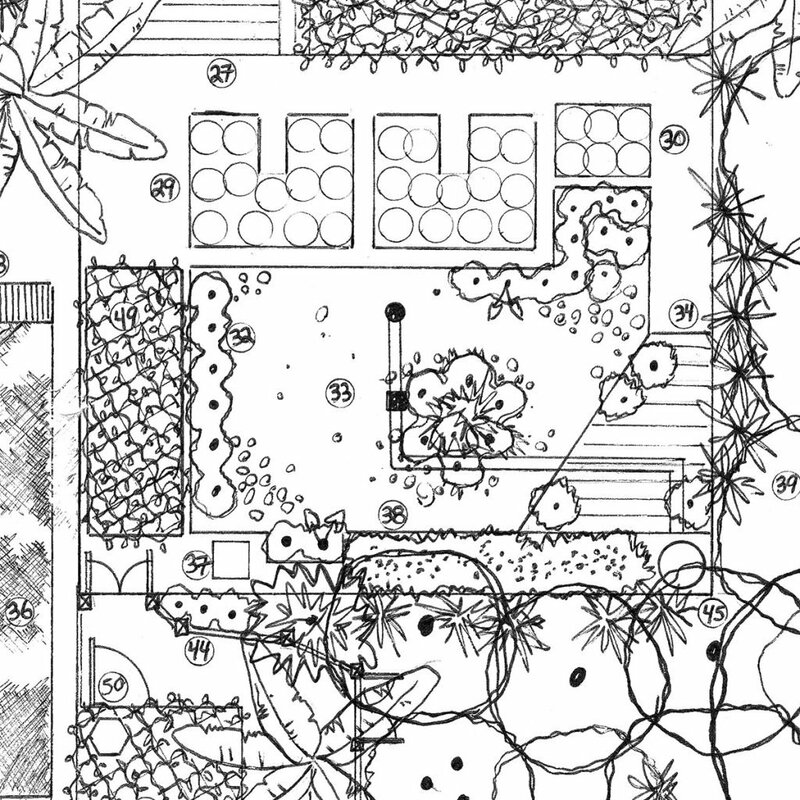 If you are designing a natural swimming pool, your work is finished. The water should be clear in no time. 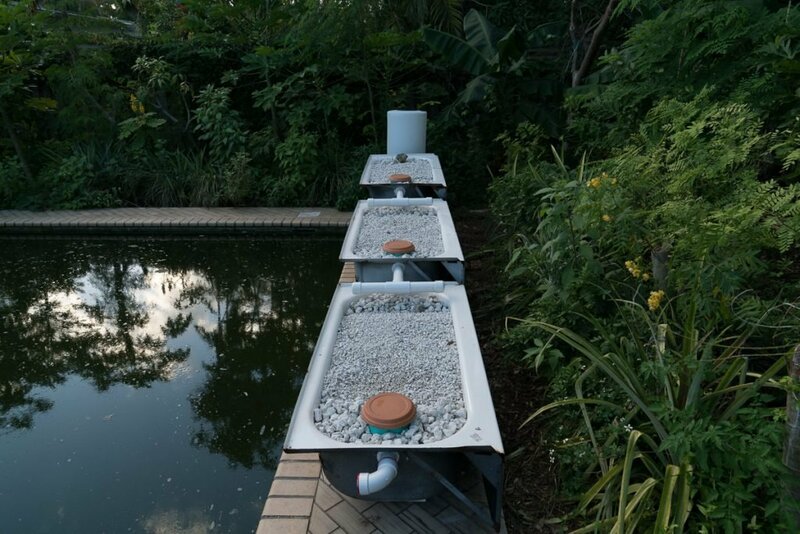 If you are designing an aquaculture system, you can start adding tilapia, crayfish, or whatever species you prefer once the system seems stabilized. The great thing about aquatic systems is if it looks good and there is life in it, its probably is quite safe. Rainy day relaxing with the girls. The most satisfying part of this project is seeing the ponds interactions with the other elements in my total design for the property. The pond has become the central element of the garden, interacting with the kitchen garden, duck area, hoop house, and compost area. It’s successful because each element has multiple functions and it’s functions are backed up by multiple elements. Plants come from the hoop house and go to the pond and kitchen garden. 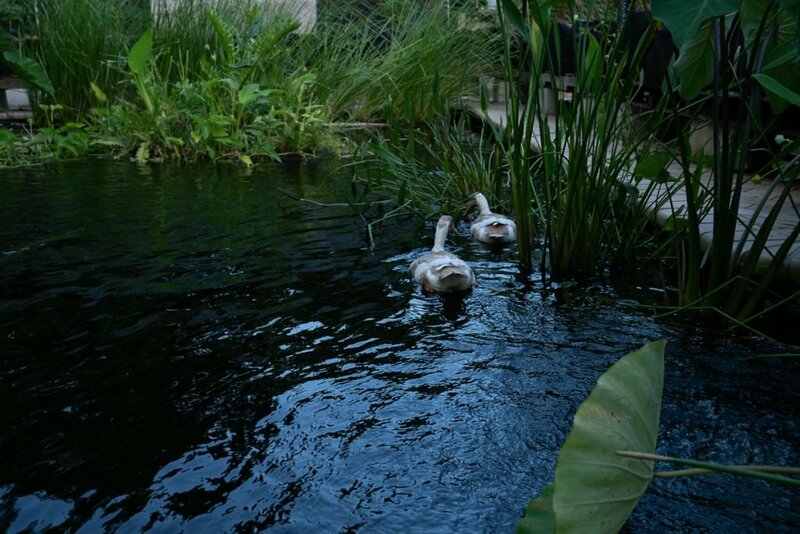 Fodder comes from the pond and kitchen garden and goes to the ducks who in turn supply fertilizer to the pond and kitchen garden. Mulch comes from the pond and goes to the compost area and kitchen garden, and so forth. There are all kinds of wildlife interactions happening between the pond and the surrounding food forest. I’m looking forward to seeing these connections become stronger and more dynamic. It can only get better and better with time!